If you haven’t visited Skinnytaste.com, you should. It’s a great website that features delicious, low-fat recipes from blogger Gina Homolka. 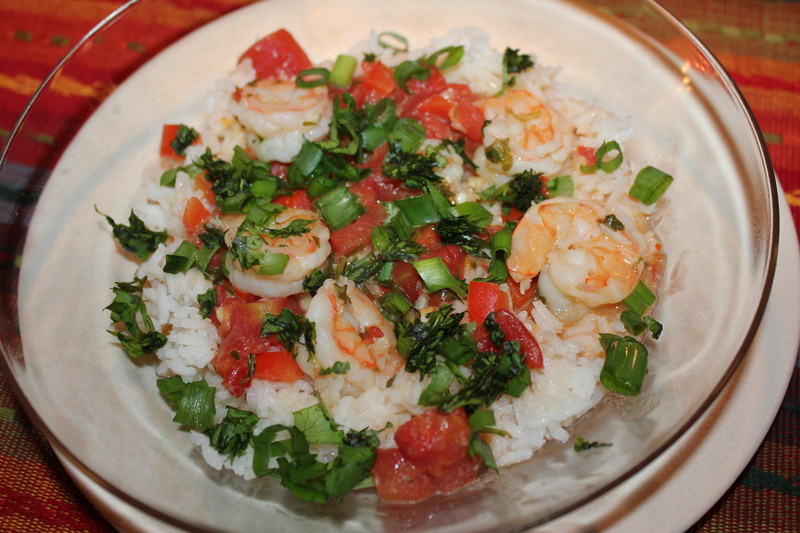 While I have not met Gina in person, I follow her blog because she has a ton of healthy recipes that don’t sacrifice on taste, like this one for Garlic Shrimp in Coconut Milk, Tomatoes and Cilantro, which I recently made to my family’s delight. Believe it or not, I followed Gina’s recipe almost exactly and the only things I changed were substituting large shrimp (which were on sale, of course) for the jumbo ones in her recipe, dicing the red bell pepper instead of slicing it, and increasing the red pepper flakes. Let me tell you, this shrimp dish is absolutely delightful. 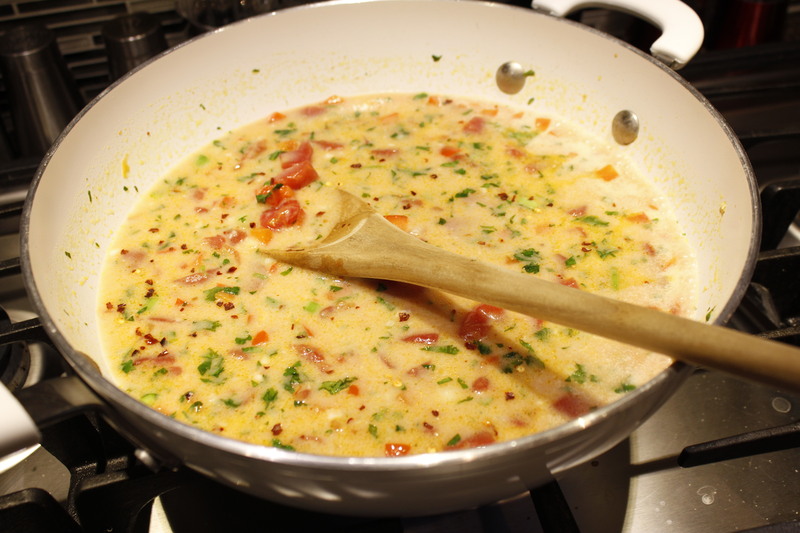 The coconut milk, diced tomatoes and garlic make a great sauce and you control the heat of the dish depending on how much red pepper flakes you want to add. Plus your kitchen smells fantastic while it cooks! Best yet, there is not a lot of prep or cooking time involved. 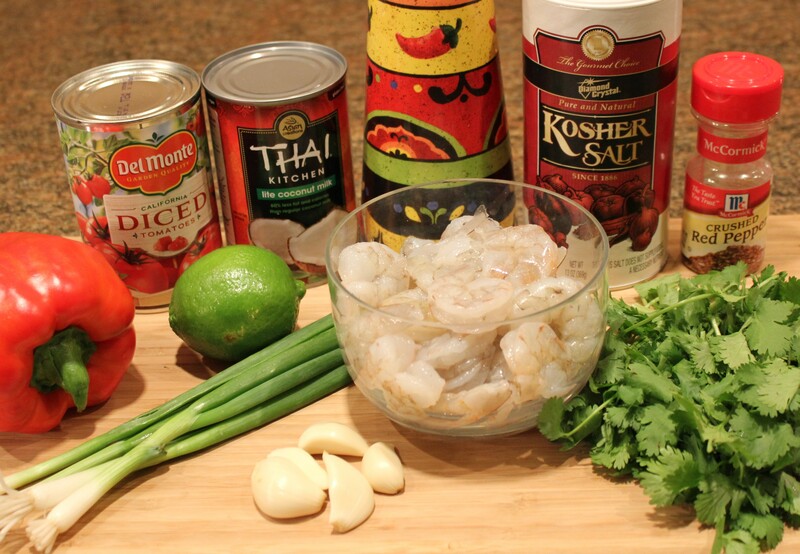 If you are looking for a different way to prepare shrimp, please try Gina’s recipe – you will so glad you did! In a large skillet, heat oil add red peppers and sauté for a couple of minutes. 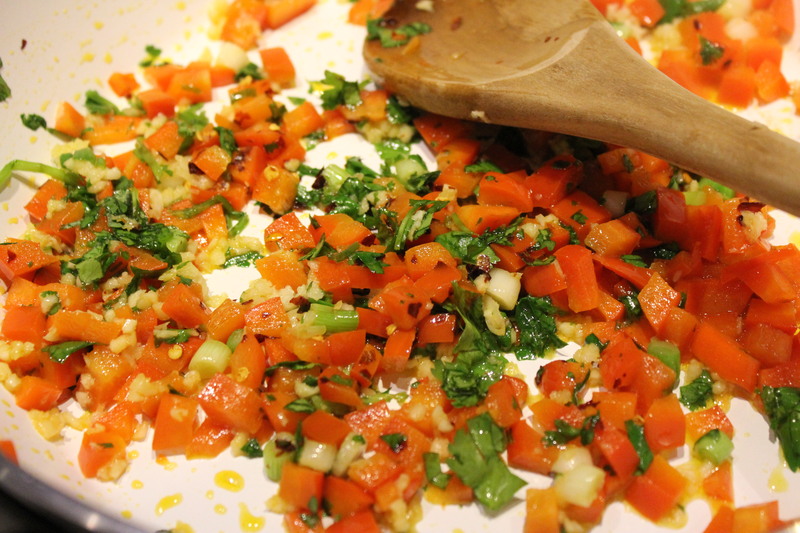 Add the white parts of the spring onions, ¼ cup cilantro, garlic, and crushed red pepper flakes to taste. Cook 1 minute. Simmer on low for about 10 minutes to let the flavors blend together and to thicken the sauce. 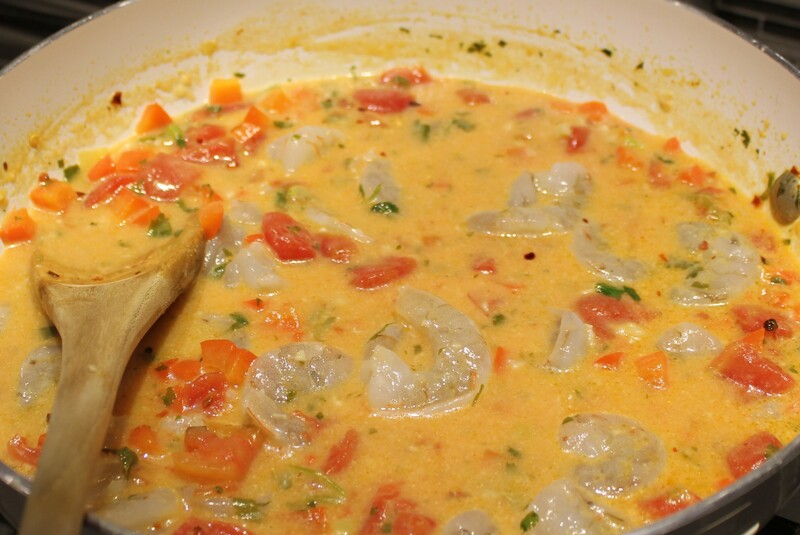 Add the shrimp and simmer for five minutes. Add the lime juice. 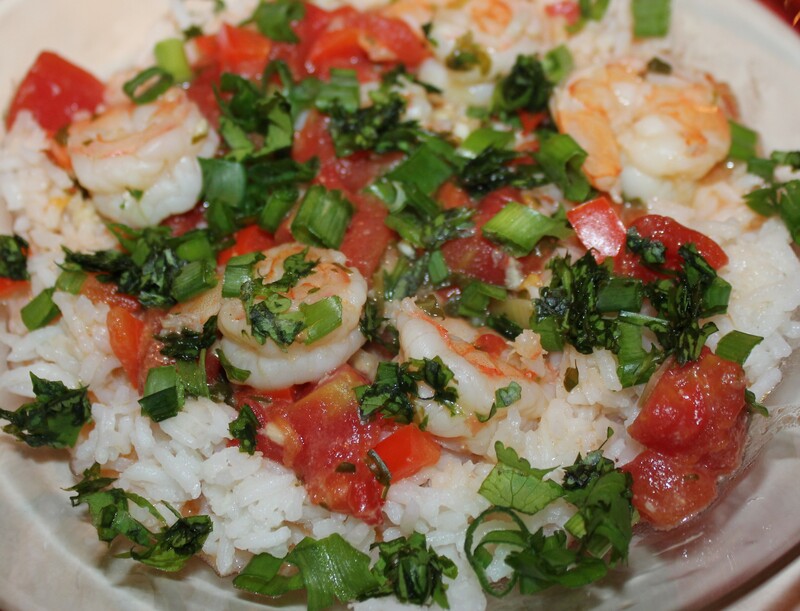 Serve over rice and garnish with the remaining spring onions and cilantro. This entry was posted in Pasta, Rice, etc., Pescatarian, Recipes and tagged eat drink and be merry, Garlic shrimp coconut tomatoes, Kelley Chisholm recipes, pescatarian recipes, Skinnytaste.com shrimp recipe, Thai-inspired shrimp recipe. Bookmark the permalink.